Going Skyward with Joe Henderson! What if the world LITERALLY turned upside-down? "One day, gravity on earth suddenly became a fraction of what it is now. Twenty years later, humanity has adapted to its new low-gravity reality. And to Willa Fowler, a woman born just after G-day, it's...well, it's pretty awesome, actually. You can fly through the air! I mean, sure, you can also die if you jump too high. So you just don't jump too high. 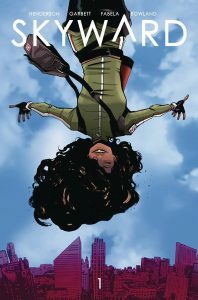 And maybe don't stumble into a dangerous plan to bring gravity back that could get you killed..."
Writer JOE HENDRSON (showrunner of Fox's LUCIFER) will be signing copies and introducing you to a LOW-G WORLD!